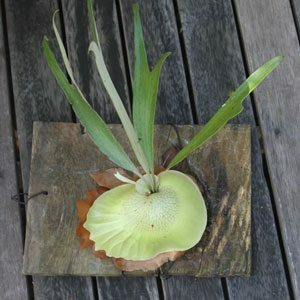 Lots of different theories on how to go about Mounting Elkhorn ferns and Staghorn ferns, and what materials to use, so lets look as the basics. 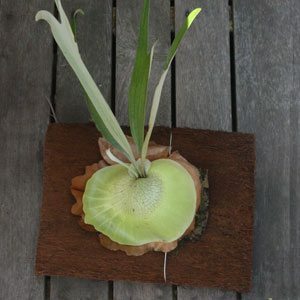 The Elkhorn fern is Platycerium bifurcatum an epiphytic fern that naturally grows on another plant (a tree) or maybe a rock. They use the other plant for support, not for food so the material is not important for food, however, it is for moisture. We have seen backing boards made from hardwood, cork, tree fern and, polystyrene, marine ply and even plastic, and although we have seen plastic mounting boards we are not entirely convinced. So what is the best backing board to mount these ferns? 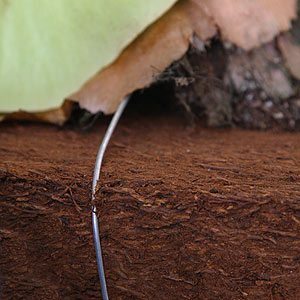 Simple, a Tree Fern Slab, long lasting, rot resistant, retains a little bit of moisture but drains well and is easy to use. If you can’t get a tree fern slab, then use Marine Ply, hardwood will rot, plastic and polystyrene are just not suitable and cork, well its OK but a Tree fern Slab is better. If you are using timber, marine ply is a must as soft timbers such ordinary hardwood and pine deteriorate to quickly to be worth while. Before you attach the fern consider where you are going to place the newly mounted plant. If you are going to hang it you will need to attach the hanging points or wires first. Water the fern a little the day before re mounting. The fern can be wired to the board or nailed to it using some galvanized flat heat nails. Many people use a strip of nylon (pantyhose) to attach the fern as wire around the front of the fern will ‘burn’ any of the new foliage on the fern it touches. Fishing line is OK, but may cut the fern, pantyhose have more give. At this stage fill the gap between the mounting board and the fern with a little organic matter, sphagnum moss and peat moss works well. Its a really good idea if the weather is warm to water lightly with a diluted seaweed fertilizer with a fine misting spray after remounting, some growers even soak then, however this is not usually needed. And now find that cool shady position for it to grow, until next time. We read a lot about feeding Elkhorns and Staghorns with banana skins, banana skins may seem to work, but really they are just rotting away, they also attract possums and rodents, and these friendly little animals can easily knock your fern to the ground. The best fertilizer for Elkhorn and Staghorn Ferns is an organic pellet, used in Autumn and again in Spring. Organic Life Pellets (by TFF) are the best we have found, a teaspoon twice a year is plenty. We also use a good all round fertilizer, (seaweed emulsion) as a spray, but only when we happen to using it elsewhere. Some gardeners use Dynamic Lifter, however we find this a little to strong for ferns and orchids, but excellent elsewhere in the garden. So replenish the sphagnum moss once in a while, a teaspoon of the Organic Life Pellets twice a year and that liquid fertilizer when you happen to be passing, your Elkhorn Fern will go bananas for that.